Philosophy is a way of thinking about the world, the universe, and society. It works by asking very basic questions about the nature of human thought, the nature of the universe, and the connections between them. The ideas in philosophy are often general and abstract. But this does not mean that philosophy is not about the real world. Ethics, for example, asks about the ideas underlying our everyday lives. Metaphysics asks about how the world works and of what it is made. Sometimes people talk about how they have a ‘personal philosophy’, which means the way a person thinks about the world. This article is not about people's ’personal philosophies’. This article is about the ideas that have been discussed by philosophers (people who think and write about ways of thinking) for a long time. Does the world around us exist? What is the relationship between mind and body? 3 Is philosophy good or bad? 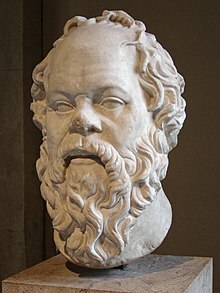 The word "philosophy" comes from two Greek words, meaning "love of wisdom". φίλος (philos) adj. "beloved" + σοφία (sophia) fem. noun "wisdom". There are different types of philosophy from different times and places. Some philosophers came from Ancient Greece, such as Plato and Aristotle. Others came from Asia, such as Confucius or Buddha. Some philosophers are from the Middle Ages in Europe, such as William of Ockham or Saint Thomas Aquinas. Philosophers from the 1600s, 1700s, and 1800s included Thomas Hobbes, René Descartes, John Locke, David Hume, and Immanuel Kant. Philosophers from the 1900s included Ludwig Wittgenstein and Jean-Paul Sartre. Philosophy is the study of humans and the world by thinking and asking questions. It is a science and an art. Philosophy tries to answer important questions by coming up with answers about real things and asking "why?" Sometimes, philosophy tries to answer the same questions as religion and science. Philosophers do not all give the same answers to questions. Some people think there are no right answers in philosophy, only better answers and worse answers. Many types of philosophy criticize or even attack the beliefs of science and religion. The answers to these questions gives the different domains or categories of philosophy. Metaphysics is sometimes split up into ontology (the philosophy of real life and living things), the philosophy of mind and the philosophy of religion; but these sub-branches are very close together. Is there more to the world than just what we see or hear? If nobody sees something happening, does that mean that it did not happen? What does it mean to say that something is possible? Do other worlds exist? Is there anything very special about being a human being or being alive at all? If not, why do some people think that there is? What is space? What is time? Is there a God who created the Universe? What are right and wrong, good and bad? Should people do some things and not others? What is beauty? What if one person thinks a painting is beautiful, but another person thinks the painting is ugly? Can the painting be beautiful and ugly at the same time? What is art? We commonly think that a sculpture in a museum is art. If a sculptor sculpts a sculpture of a rock from clay, and puts it in a museum, many would call it art. But what if a person picks up a rock from the ground - is the rock a piece of art? What do the words we use mean? How can we say things (especially ideas) in a way that only has one meaning? Can all ideas be expressed using language? How does the truth of an argument's premise affect the truth of its conclusion? How can we reason correctly? Is time really money? or have we made it so? Does love, beauty, or justice hold any value? Other divisions include eschatology, teleology and theology. In past centuries natural science was included in philosophy, and called "natural philosophy". Does philosophy do any good? Very few people would dispute this. It is easy to argue that philosophy is a good thing, because it helps people to think more clearly. Philosophy helps people to understand the world and the way people act and think. Philosophers believe that asking philosophical questions is useful because it brings wisdom and helps people to learn about the world and each other. Some philosophers might even argue that the question "Is philosophy good or bad?" is a philosophical question itself. However, some people think that philosophy is harmful, as philosophy encourages free-thinking and often questions the beliefs that others hold. For example, philosophies such as some existentialist views say that there is no meaning to life or human existence, except the meaning that we make up or invent. People from some religions do not agree with the beliefs of existentialism. It should be noted that every major science, including physics, biology, and chemistry are all disciplines that originally were considered philosophy. As speculation and analysis about nature became more developed, these subjects branched away. This is a process that continues even today; psychology only split in the past century. In our own time, subjects such as consciousness studies, decision theory, and applied ethics have increasingly found independence from philosophy as a whole. Because of this, philosophy seems useful because it makes new kinds of science. Philosophers ask questions about ideas (concepts). They try to find answers to those questions. Some thinkers find it very hard to find those words that best describe the ideas they have. When they find answers to some of these questions philosophers often have the same problem, that is how to best tell the answers they found to other people. Depending on the meaning of the words they use, the answers change. Some philosophers are full-time thinkers (called academics), who work for universities or colleges. These philosophers write books and articles about philosophy and teach classes about philosophy to university or college students. Other philosophers are just "hobby" thinkers who think about philosophy during their free time. A small number of hobby thinkers have thought so much about philosophy that they are able to write articles for philosophy magazines. Other people approach philosophy from another job. For example, monks, artists, and scientists may think about philosophical ideas and questions. Most philosophers work by asking questions and looking for good definitions (meanings) of words to help them understand what a question means. Some philosophers say the only thing needed to answer a question is to find out what it means. The only thing that makes philosophical questions (such as those above) difficult is that people do not really know what they mean Ludwig Wittgenstein held this view. Philosophers often use both real and imaginary examples to make a point. For example, they may write about a real or fictional person in order to show what they think a good person or a bad person is like. Some philosophers look for the simplest way to answer a question and say that is probably the right answer. This is a process called Occam's razor. Others believe that complicated answers to questions can also be right. For an example of a philosophical problem, see the God paradox. Philosophers use logic to solve problems and answer questions. Logical consistency is a cornerstone of any acceptable theory. Philosophers who disagree with a theory will often try to find a logical contradiction in a theory. If they find a contradiction, this gives them a reason to reject that theory. If they do not find an inconsistency, the philosopher might show that the theory leads to a conclusion which is either unacceptable or ridiculous. This second approach is usually called reductio ad absurdum. People listed here should be genuine philosophers, rather than social or political campaigners. The lists are not meant to be compete. ↑ Russell, Bertrand 1912. The problems of philosophy. Home University Library.